If you tuned in the the most recent Olympic Games, chances are you enjoyed watching the trampolining events. Olympic trampoline gymnastics are extremely impressive to watch, as the trampoline allows athletes to perform feats that would be impossible to perform on the floor. Nowadays, more and more people are becoming involved in this sport as a way of maintaining fitness. So, what is the history of this sport, and what is involved? Where can you find an Olympic trampoline for sale? Read on for our handy guide. What Is The Trampoline in Gymnastics? When Did Trampoline Become an Olympic Sport? How Big Is an Olympic Size Trampoline? Trampoline gymnastics is a separate sport in the Olympics from the regular gymnastics category, which is more well-known. Whilst the two share some similar skills and features, this event involves routines consisting of a range of gymnastic elements performed on an Olympic-sized trampoline. Trampolining has only become an Olympic sport relatively recently. However, it had already become an established competitive sport before it became an Olympic event. Trampolines as we recognise them were first developed in 1936 by gymnasts from Iowa University. However, it wasn't until 1964 that the first world championship was held in London, as until then competitive trampolining had been limited to the confines of Universities and schools. 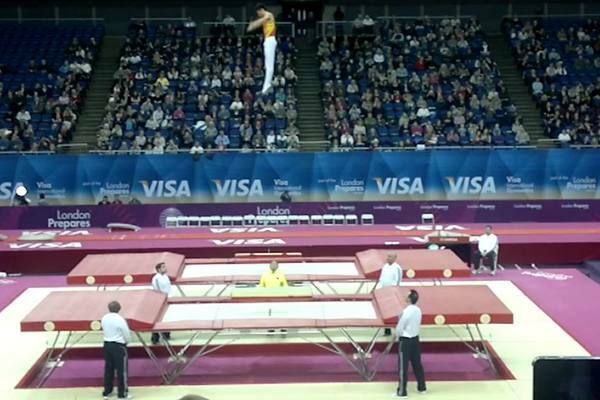 Interestingly, Olympic-style trampolines have not only been used for gymnastics. As they offer an experience of weightlessness, they have historically been used by NASA and the US airforce as part of training for pilots and astronauts. 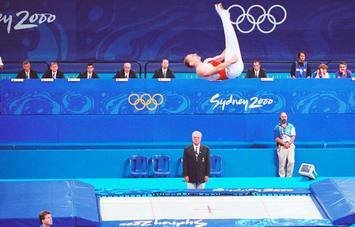 Trampolining first became an official Olympic sport at the Sydney Olympics in the year 2000. There are strict regulations for what constitutes an Olympic trampoline, and these are stipulated by the Fédération Internationale de Gymnastique (FIG). Most other competitive trampolining bodies also follow these guidelines. Olympic trampolines are usually referred to as being 17 feet long and 10 feet wide. However, these are in fact rounded measurements, and the actual measurements are far more precise. A trampoline that meets the regulations for an Olympic competition measures exactly 16.5682 feet x 9.54724 feet! However, the size of the trampoline is not the only thing that is measured very precisely. The jumping mat, which is around 6mm in thickness, must be timed and shown to return to it's original form in under one second after impact. Olympic trampolines also have to include safety padding around the entire edge of the trampoline, in a similar way to most trampolines that people have in their back yards. This padding cannot be any thicker than 2.16535 inches. So, as you can see, for a trampoline to be allowed in a competition it has to obey very strict guidelines. When it comes to height, the measurements are also extremely precise. To meet the FIG approval criteria, a trampoline must be exactly 3.78937 feet high. 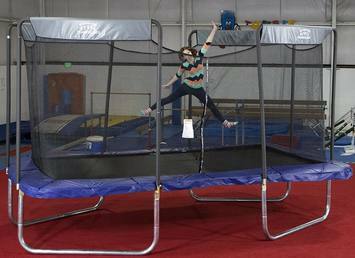 Most Olympic-sized trampolines available for sale have a maximum weight limit of 350 lbs. When an athletes compete in the Olympics, they must perform two routines. The first is the compulsory routine, which is decided by committee and set as a non-optional series of combinations. All athletes must, therefore, perform the same first routine. The second routine is voluntary. This means that athletes and their coaches are permitted to create a routine of their own choosing. Feet: As the name suggests, this requires the athlete to land on the feet in a standing positing. Seat: Athletes must and in a seated position, with the legs together and straight. The legs should be perpendicular to the body. ​Front: The athlete lands on the front of their body. The body should be straight and fully horizontal. Back: The athlete lands on the middle region of their back with knees up. 1. The routine must begin and end with the athlete standing upright. Athletes are allowed one extra bounce to center and balance themselves before landing on the feet. 2. After the judges have given a signal to begin, the athletes must commence their routine within one minute. 3. At the end of the routine, the jumping surface must stop moving completely. Once this has occurred, the athlete must remain in their final position for 3 seconds before disembarking from the trampoline. Difficulty: Each combination in trampolining has a corresponding score value for difficulty. Therefore, the athletes will put together a routine in advance and submit this to the judges beforehand. An athlete may opt to perform a more difficult routine in order to gain a higher difficulty score. The judges will ensure that all of the components are actually present during the routine and then add up the final score. There is no limit to the score that can be achieved for difficulty. Execution: In essence, this refers to how well the athlete performs their routine. Each judge will give a score out of 10, taking away 0.5 points every time they see a mistake. Once scoring is complete, the highest and lowest score will be discounted. This leaves three remaining scores out of ten, which are totalled to make a final execution score. The maximum score for execution is 30. 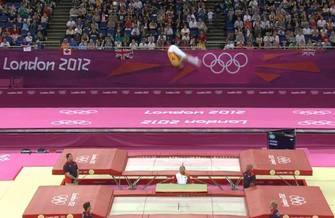 Time of flight: This has only been part of the scoring system in competitive trampolining since 2010. This encourages the athletes to perform higher jumps. The total amount of time spent in the air is added up and then included in the final score. Since 2011, this has been measured by a specially-designed machine. As a highly competitive and professional sport, athletes who wish to attain the high standards required to be an Olympic competitor must undergo rigorous and professionally-designed training programmes. These will be under the supervision of a coaching team. There is no set time that athletes train for, as it depends on their individual needs and whether they have n approaching competition. However, most athletes will train for up to 6 hours a day for 5-6 days a week to reach the required standard. It can take around 7 years to reach an Olympic level. There are several attributes necessary to become an Olympic trampoline athlete. First of all, a very high level of physical fitness is required. Also, the athlete will need to be able to generate the power necessary to achieve very high jumps. Without enough height, more demanding moves such as somersaults and mid-air twists will not be possible. Furthermore, a huge about of courage is required, as these moves are challenging and present a level of risk. Finally, athletes must be highly dedicated. As we mentioned above, the many hours of training required over a long period of time take commitment and focus. The USA trampolining team that competed at the 2016 Olympics in Rio consisted of two people, a male and a female athlete. Logan Dooley was the male athlete, and finished in eleventh place for the USA. Nicole Ahsinger was his female teammate. She finished slightly lower than Dooley in fifteenth place. If you want to have a go at bouncing on an Olympic-sized trampoline, or are even considering taking the sport up more seriously, you have several options. Perhaps the easiest way to access an Olympic trampoline is to visit your local trampoline park, as they often have Olympic-sized trampolines as standard that anybody can use. Also, there may be a specialist gymnasium or trampolining club where you can have a go. 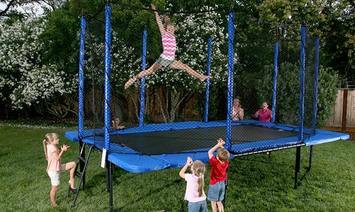 Gap-free construction: This trampoline is manufactured so that there are no gaps where body parts can get caught between the trampoline bed ad the frame. This greatly increases the safety of the trampoline. Thick padding: The frame around the edge of the trampoline bed has a thick padding, and this is reversible so you can choose between green and blue. This provides a cushion as you climb on and off, and also protects against any bumps if you fall on it. Safety enclosure: Of course, in the Olympics the trampolines do not have a safety enclosure as it would obscure the view of the athlete. However, for home use a safety enclosure is very important, as it prevents people from falling from the trampoline and potentially sustaining a serious injury. The net is heavy-duty and closes with a double zip. This is a great feature, as it allows the enclosure to be opened and closed from both the outside and the inside. Furthermore, this type of fastening is extremely secure, preventing anyone from falling through the entrance. Tall enclosure poles: As you progress, you will gradually build the ability to bounce very high. A tall enclosure is an important feature, as it gives you protection even at height. Overlap entrance: Instead of a regular entrance, this has an overlapping section in the enclosure for athletes to climb through. This is probably the safest form of entrance, as there is no exposed opening. This means it is impossible for anyone to fall through the entrance. Back-up support system: The enclosure is supported by more than one mechanism. This means that if one fails, the other will continue to protect the athlete. This provides an excellent degree of safety. Shock-absorbing: The poles of the frame are designed to flex with impact, allowing them to withstand the large amounts of force exerted on the trampoline by an athlete. Safety pad: Like the Skywalker model, this has a heavy-duty thick padding that covers the area around the springs. This prevents injury when climbing on or off, and also protects the user if they mis-bounce and fall on the frame. Unlike the Skywalker, this is not reversible, and comes only in blue. 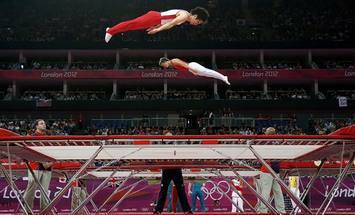 Olympic trampoline﻿﻿ gymnastics is and dynamic sport, both for audiences and participants. Luckily, there are many ways that you can access this excellent form of exercise for yourself. Hopefully, having read our comprehensive guide, you now know a little more about Olympic trampolines and their measurements. Furthermore, we hope we have whetted your appetite to find out more about Olympic trampoline gymnasts and the incredible moves and routines that they perform. If you are hoping to find an Olympic trampoline for sale, the options we reviewed above are great options. Both can be purchased from the retailers' websites in the USA. Before you attempt any of the more risky moves you may have observed when watching Olympic trampoline gymnastics, please seek the advice and supervision of a qualified and registered instructor. Unless performed properly, movements such as somersaults and mid-air twists can be very dangerous. A coach will be able to advise you on how to perform these movements properly and safely. Happy bouncing!